The major barriers to quality eye care services in Zambia are similar to those found throughout sub-Saharan Africa: human resource shortages, lack of quality equipment and poor infrastructure. Located in Zambia’s capital city, Lusaka, University Teaching Hospital’s Ophthalmic Centre is the country’s principal training centre for eye care professionals. It provides training for several levels of eye care workers and ophthalmic outreach services to 15 districts in central and southern parts of the country, which has a population of 2.8 million. Since 2004, Operation Eyesight has strengthened the hospital’s eye care services by providing equipment, medical supplies and support for external training of doctors and staff. In 2012, we were able to refurbish the hospital’s Ophthalmic Centre, thanks to our donors and our partners, Nava Bharat Ventures of Hyderabad, India and the Government of Canada. The centre, which initially served about 1.2 million residents in Lusaka and surrounding areas, is now expanding its reach to provide services to more people. Trachoma is an especially painful affliction which eventually leads to complete and irreversible blindness. Dr. Boateng Wiafe, now Operation Eyesight’s Director of Quality and Advocacy, helped create a trachoma control project in Gwembe Valley, adjacent to Sinazongwe. There, a collaborating team from Operation Eyesight, Kenyan ministry partners and other NGOs implemented the World Health Organization’s SAFE strategy in 2001. The program succeeded in reducing the overall trachoma prevalence in Gwembe from 47 percent to 7.6 percent. Operation Eyesight’s project partners include Zambia’s Department of Water Affairs, which is providing drilling, equipping and monitoring expertise. The benefits of drilling a well include much more than blindness prevention. Villagers enjoy the luxury of clean, fresh water upon demand; garden plots flourish around the water points, thereby improving diets; women no longer walk several kilometres a day to fetch their families a few litres of questionable water; and the enrolment in local schools increases, helping educate the community about the importance of hygiene. In partnership with the local authority, we also rehabilitated 15 dysfunctional boreholes (originally drilled by other well-intending organizations) to increase communities’ access to functioning water points. In June 2016, in partnership with Standard Chartered Bank and the Zambia Ministry of Health, we launched a comprehensive, four-year project to eliminate avoidable blindness from three shanty towns in Lusaka: Chawama, Mandevu and Bauleni. This project includes integrating primary eye care into primary health care by establishing eye departments in existing clinics; strengthening eye care services within the target communities; and educating community members on the importance of eye health. Our goal is to develop a model of comprehensive eye health care that can eliminate avoidable blindness on a sustainable basis and be replicated in other shanty towns in Lusaka. Watch for future announcements about another exciting initiative that will bring another 25 wells to Zambia, thanks to generous people just like you! Thank you for giving new hope to people like Akua and Irene! 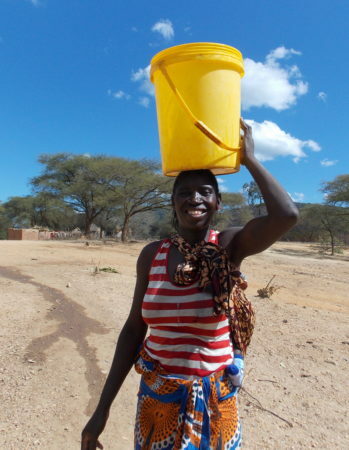 Rehabilitated boreholes are revitalizing communities and creating new opportunities for women!